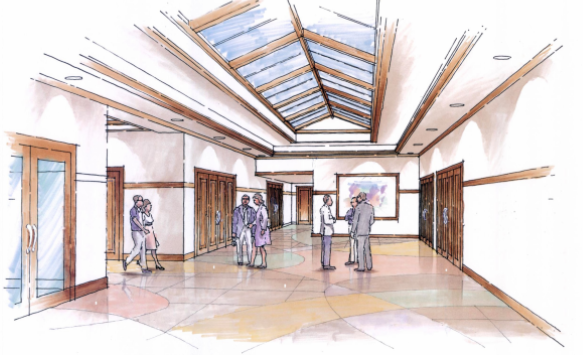 Many parents have inquired about the progress of theproposed Community Centerand Parish Capital Campaign. All are invited to drop inthis evening between5-7pmfor an informal informational session with wine and cheese. At5:15 and 6:15I will give a brief overview of the project and then Fr. John and I will be available to answer any questions you may have. This Sunday is aRise and Shine Mass at9:30 am. Fifth grade students from the school and faith formation program will assist with key roles in this Eucharistic celebration. Many of you may have begun your Halloween preparations. OnOctober 31, we will have anoondismissaland parents are invited to join us for ourHalloween Parade at11 amin front of the Church. Students have been reminded in class that "group costumes" are not permitted at school. Additionally, any accessories such as weapons or swords need to be left at home. Finally, students need to be dressed appropriately for school in accordance with the school handbook free dress policy. Recently stories of social media threats and actual appearances of "scary" or "creepy clowns" in various parts of our country, including our own geographic area, have created heightened concern for our children's safety. Our schools'regular drills and safety protocols ensure our school personnel are prepared to safeguard all of our students. Thank you for your cooperation and assistance in these important matters; remember that we will keep our parents and families informed if anything happens on one of our campuses. As to this particular phenomenon, law enforcement is responding to this threat to determine its origins or if it is a "hoax" or copycat activity by odd individuals, and to provide for the public safety, especially of our children. Thus far it has been difficult to predict where it might occur. We urge parents to be aware of their children's fears. Actively reassure them, reminding them that the adults in charge are doing everything they can to keep them safe, and it is always important for them to follow directions from adults in charge, so that they can stay safe. Encourage your children to report any threat they actuallyseethat worries them, but not to listen to rumors or stories that may or may not be true. We will hold our annual disaster drill onFriday, November 4th.Although we hope to never need to implement these procedures, it is imperative that we all review and practice the various aspects of the plan.On that day students are picked up between11:15 and 11:45in the new plaza area at the end of school building near the cross walk.Clickherefor the Emergency Drill form that you can fill out in advance. Students will only be released to those listed on their student profile andALL adults MUST show their ID.If someone other than the parent or another personalreadyon your Emergency/Authorized Pick-up list will be picking up your child on the day of the Disaster Drill, please email the office with that authorized person's name.Panther House is closed that afternoonso that we can review drill as an entire staff. 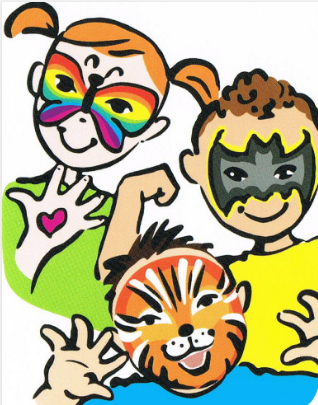 If you are shopping for Halloween costumes, decorations or treats, consider shopping throughsmile.amazon.com/ch/94-1558501and Amazon will make a donation to St Perpetua School. Our Scholastic Book Faire starts next week!Book Fair dates:October 17th-October 21st. Shopping hours:8am-4pmThis Friday, each class will have the opportunity to preview the books, and fill out their personal wish lists to take home. Book Fair: Where books are the treasure! 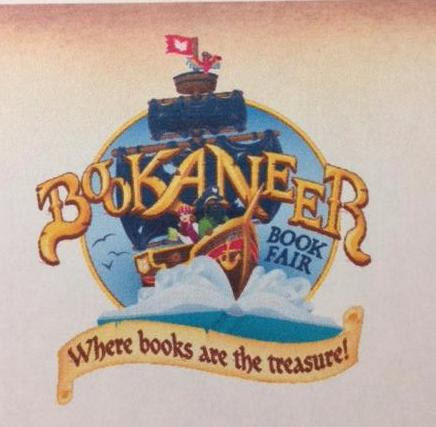 This season's Book Fair will be a swashbuckling celebration full of adventurous activities and hundreds of books kids want to read. October 14th- "Bagels with Books"a special event for our amazing teachers. Teachers can preview our new Scholastic books and fill out their classroom wish lists. October 17th- "Bookies & Cookies"event forKindergarten and TK only from9:00am-10:30am. Information will be given to the students by their teachers. October 19th- "Pastries with Parents"a special morning tradition for ourparentsfrom8:00am-10:00am. Pastries and coffee will be served. With your book purchase during this event, your name will be entered into a wonderful raffle. We will continue our tradition with thegrade that buys the most books, will be awarded a special party. They may choose apizza party, or ice-cream social as their prize!This school contest will be split up into two:elementary grades, and junior high. Guessing Jar- During our fair, please remember to fill out your guess as to how much gold is in the jar! The winner and prize will be announced on the last day of the fair. Remember, all purchases benefit our school. We look forward to seeing you and your family at our Book Fair! KEEP YOUR VITALITY UP AND SUPPORT YOUR SCHOOL! OnWednesday October 26, student leadership will be selling the kid's Vitality bowl for ourRed Ribbon Week saleencouraging healthy eating choices. The 14-oz. kid's bowl includes Organic Açaí, Apple Juice, Bananas, and Strawberries. These bowls are both dairy- and nut-free, and there is a gluten-free option as well. You mustpre-order the $7 bowlsand the order forms MUST be turned into the office byFriday, 10/21. Clickherefor order form or find in "This Week's Flyers" section of the bulletin. The bowls will be delivered at recess on the26th of October! Help your kids stay healthy by buying them a Vitality bowl. Leadership is holding a Halloweencoloringcontest. Templates can be picked up at the office, and submissions are due byOctober 24. Hi St. Perpetua School Friends and Family! Make sure our ID number42570&Student's Nameis added at checkout. 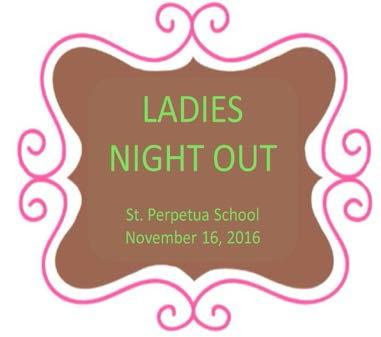 Each year, St. Perpetua School offers aparent education nightto assist parents with navigating the ever-changing world of technology. 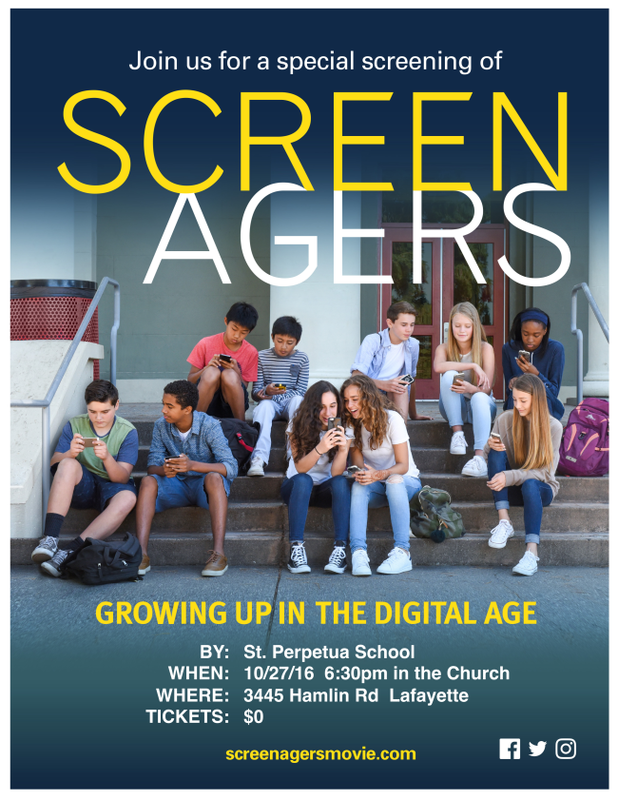 OnOctober 27th at 6:30pm, we will be hosting a screening of the documentary,"Screenagers: Growing Up in the Digital Age". This movie explores the affects and impact of various types of screen time in our society. I was able to attend a viewing of Screenagers a few weeks ago and I strongly encourage all Jr. High parents to attend. Please let me know if you have any questions. Thank youto all to all the families who supported St Perpetua Technology through generous donations and registration to participate and spend a fun filled day golfing! TheTee Off Fore Technology Golf Tournamentwas a huge success and special thank you goes out to our golf team;Sean Sabarese, Kelli Wynne, Steve Shea, Lisa Winter, and Allison Mein. Another shout out goes to ourTK, Kindergarten, 3rd, and 5th grade classroomsfor reaching thegoal of greenside sponsorship!Great job! Much neededChrome bookson there way soon due to the success of this fundraiser. Thank you! I'mDelaney Maloneyin 7th grade and last year I got diagnosed with Complex Regional Pain Syndrome (CRPS). Now I am helping to spread awareness of CRPS duringCRPS Awareness Monthin November and raising money to send kids to a camp where they can meet people that have similar issues. If you are available I will be doing a walk around the reservoir at2:00 p.m.onSunday, November 6. If you want to buy my t-shirt go tothis linkbeforeOctober 18. If you join my walk, please wear something orange for CRPS - it doesn't have to be my t-shirt. Come in out of the rain and join usthis Fridayat Cafe` Perpetua. We have inside seating and many delicious goodies to take the chill away! Try a pumpkin latte or a mocha to warm you up! 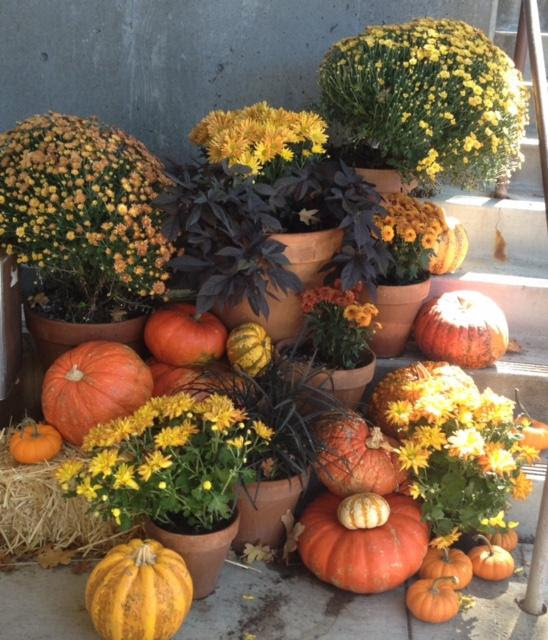 We will also be selling the garden's last harvest of the season including floral arrangements. Come join us onFriday October 28for Halloween fun! We will have face-painting and Halloween activities like pumpkin bowling from3:30 to 4:15.Email me if you would like your child to have their face painted. They will be the first to get their face done. Are you short on time? Panther House can help you out. We will offer special book fair hours on nextWednesday, October 21from3:30 to 4:00. Our staff will bring children up to the library and supervise your little shopper. If you would like your child to shop for books during after school hours, just drop me an email. October 28:(3:30 to 4:15)Halloween activities, special Halloween treats, face-painting and Email me if you would like your child to have their face painted and they will be the first to get theirs done. November 4:Disaster Drill ~noondismissal. Panther House isclosed in the afternoon. We have filled ALL the spots to help decorate faces or Halloween activities after school onOctober 28. There was more demand than spots available. I will contact the families to let you know if your child is selected and what the requirements will be. Thanks! There are threeSign-Me-Up partiesstill open for registration!It's a great way to get involved withthe school community and it supports our Parent Association fundraising efforts. Trivia NightThisSaturday evening,October 15th~ Last chance to sign up for a great evening of food, beverages and fun!Clickhereto sign up. Scrip Family Reportsare coming hometoday/tomorrow~ look for it in your youngest child's backpack. Reminder: There will beScrip Training & OverviewthisFriday, 10/14from7:45 - 8:30in the RRC.